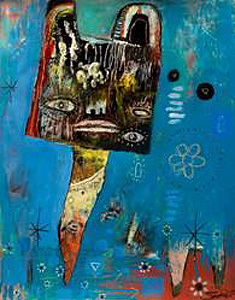 Jesse Reno – A Self taught, mixed media painter. He has been drawing since age 5, exhibiting since 2001. Has exhibited extensively in USA, Canada, Europe. 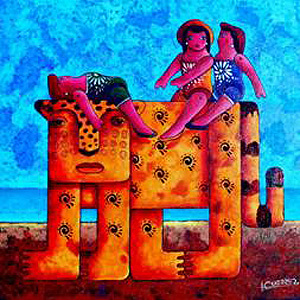 This is his 4th year exhibiting in Puerto Vallarta. In his paintings, Portland-based artist Jesse Reno, the shamanic beings struggle to find their place in a world simultaneously on the verge of expanding and collapsing. Totem animals and Native American figures reverberate memories of people who once lived as one with nature. Marked by symbols, these figures seek their dreams in the growth of trees and the passing of spirits. On a quest to find their true selves, they collect feathers and relics left by past encounters and past lives. Ignacio Guerrero – “Stop scratching the walls!”, is the phrase that his mother scolded him most consistently with in his childhood and of which he still remembers fondly. Even though he knew he would be punished, he continued to paint on the walls. Born on December 4, 1963 in Guadalajara, he is essentially a self-taught artist. He displayed an interest in drawing and painting from childhood. After obtaining a degree in graphic design at the University of Guadalajara, he achieved the post of art director for several prestigious advertising agencies in the city, as well as illustrating for numerous magazines and newspapers. Nevertheless, he subsequently left the world of advertising to devote himself to painting; something that he feels gives him total freedom of expression. 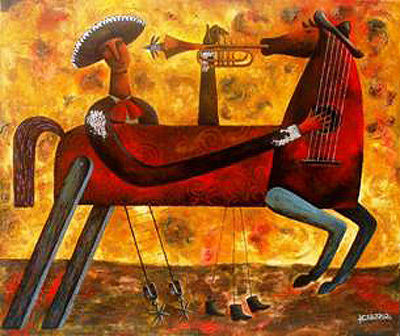 His work, which is surrealist in quality, has been exhibited more than 60 times in Mexico and abroad, in places as distant as Portugal, Italy, Australia and New York. And has to his credit many awards and special recognitions. In 2009 and 2011, his work was selected by the National Committee of the international Biennale of contemporary art in Florence, Italy. “Paint until you drop”, says Ignacio; “or until there is nothing more to say to the canvas”. 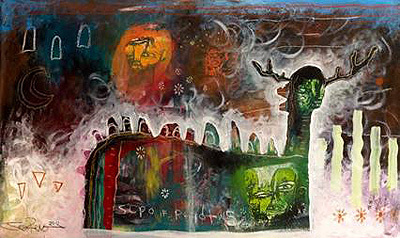 The fun surreal dream-world of Ignacio Guerrero, conjures up hiding places along the road to the impossible; the flight of a bird, cages, horses galloping with energy, mermaids, men and women in full, quasi-Kafkaesque, metamorphosis show familiar elements in this strange world produced from the depths of his acrylic and oil embedded brushes which create the poetry of his paintings. Everything that is observed is a game, a wonderful set of tones and textures. Motivated by fantastic muses, his pictorial work celebrates the life and obliges us to look at something that has not stopped being here, but we often forget: the harmony of nature. Cocktail Reception 6 to 10 pm.